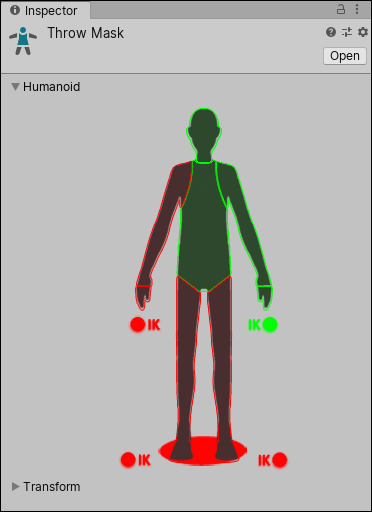 To include animation from one of these body portions, click the Avatar diagram for that portion until it appears as green. To exclude animation, click the body portion until it appears red. To include or exclude all, double-click the empty space surrounding the Avatar. 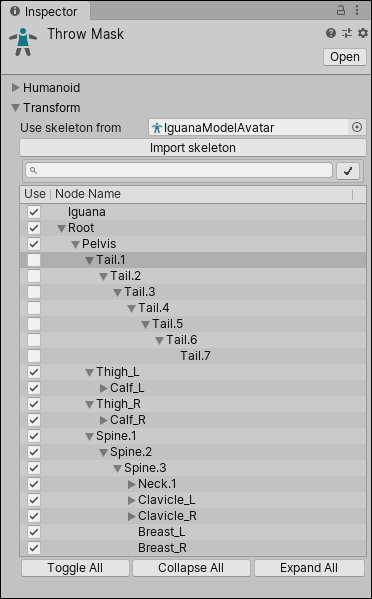 You can also toggle Inverse Kinematics__ (IK)__ for hands and feet, which determines whether or not to include IK curves in animation blending. Assign a reference to the Avatar whose transform you would like to mask. You can check each bone in the hierarchy to use as your mask. See in Glossary to apply masking at runtime, or in the import settings of of your animation files to apply masking during to the import animation. See in Glossary. Also, the unused curves need not be calculated during playback which will tend to reduce the CPU overhead of the animation.